I have some things to share about teaching weather science, but . . .
ONLY 4 MORE WORK DAYS UNTIL SPRING BREAK!!!!! Sorry for yelling. I cannot wait. March can truly be sooooooo long! I’m tired. They’re tired. It’s a good thing. I cannot believe there will only be 8 weeks of school left when we return! Amazing that another school year is so close to being over. This week our school heard the great news that we are now a California Distinguished School. I’m so proud of our little school. Title 1 with an extremely varied population. We work hard, the kids work hard and it is just a fantastic place to be! We’ll be working on our weather and seasons science standards when we get back from break. The California standards on this subject are not very robust – so we bump things up a few notches. As I’ve mentioned before, our classroom themes each month change. THE WHOLE ROOM.. all bulletin boards and everything MUST (because all 3 of us 1st grade teachers who have been working together for over 15 years are OCD) come down and new ones must go up. To ensure everything remains standards driven, our monthly themes are based around or social studies or science standard for the month. All of our writing and reading activities are based around that. One of my favorite bulletin boards is the one we do about the water cycle. 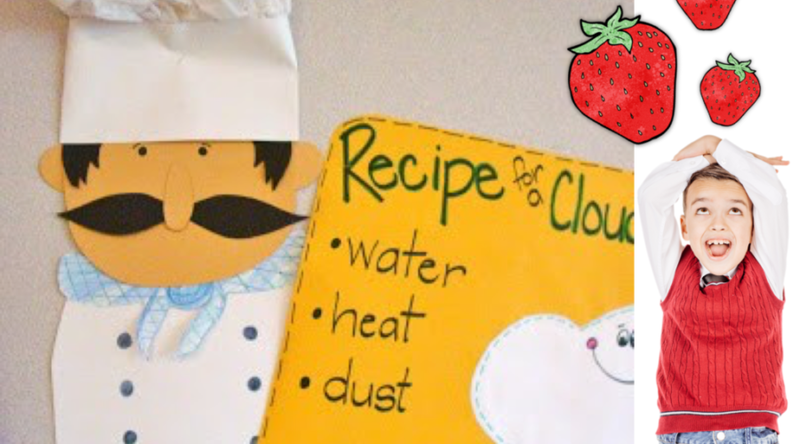 This little chef cooks up a recipe for clouds and explains the “procedure” for creating the water cycle. The kiddos write the recipe, noting the ingredients and the procedure (read: water cycle) necessary to create a cloud. After reading this fun tale to my kiddos, we do a little crazy weather activity ourselves! I take a photo of them ducking away from the food of their choice that is falling from the sky. This idea to have them pose like the “sky is falling” was inspired by a student teacher, Lisa, that I had the pleasure of having in my room long ago. Taking their photos and cutting out the background just makes this writing activity that much more fun! I absolutely adore using interactive readers with my kiddos. They gain so much in the way of decoding skills, fluency, inference and comprehension ability. The readers in the resource I’m using this month are awesome. The kiddos interact with them in a variety of ways. There are extension activities provided, too. These additional activities extend the readers and keep my kiddos thoroughly engaged in learning and using and developing those ELA skills. One of the big writing lessons this week is our opinion piece on favorite seasons. This resource comes with differentiated organizers to assist all levels of early writers in creating a magnificent paragraph about their favorite season. The art project that goes with this writing activity is a definite favorite amongst the kiddos. They love that it requires them to utilize a few different mediums. I have my kiddos practice basic sentence skills a lot. Fabulous Weather offers plenty of opportunity for that! This resource includes Change a Phrase where students will create statements and questions from a given phrase. Additionally, there are some weather-themed Fix-a-Sentence activities, too! Be sure to check out the preview Fabulous Weather in my store. It included a FREEBIE! This resource is just stuffed with all kinds of weather fabulousness! Head on over and check it out! Big congrats to you and your school! Yay for Spring Break, too!! We'll be doing weather soon, this would be a great addition! I love weather units! I'm another So Cal. gal and we earned The California Distinguished Award two years ago. Congratulations!! It's a great feeling to have your hard work recognized. My email is [email protected]. Enjoy your spring break Traci! Mine starts Friday too. I guess that I should count how many days are left till the end of school but this class is so delightful that I don't want to see them go! Congrats on your award! Your district must be so proud! Congratulations to you and your school on the award!! Hard work does pay off! congratulations to you and your school on all the hard work that has been put in to achieving that award. Love the look of your unit, especially the change a phrase freebie. Enjoy your spring break! It goes by really really fast!! I JUST finished up a weather unit, but this is just too cute! I love, love, love your chef! Love your chef! Maybe my school will get your little sweetie, since I'm in Texas! Have a great Spring Break! Many congrats on earning the Distinguished School award. My school did too! Your chef is beyond cute! Congratulations on being a distinguished school! That will make your students feel some great self-worth – I hope there is a great celebration for them. Although I don't officially teach science and social studies, being a resource room, we do use a lot of the curriculum content to reinforce learning along with writing and reading skills. Would love to have more weather stuff as our third grade does a large unit and the majority of my room right now is in that grade. Hey Vicky… check your email. So cute! We're teaching weather right now! !